Dogs who are 20 per cent or more above their ideal weight are obese. That means a generously sized Labrador weighing 30kg at his ideal weight would be classed as overweight when he exceeded 33kg, and obese by the time he was 36kg. Worryingly, it has been found that obese dogs tend to have their lives cut short by two years on average, compared to dogs at ideal body weight. Overweight dogs are prone to joint strain, fatigue, breathing difficulties, a tendency to suffer heatstroke, and irritability. They are also less able to fight off infections, particularly viruses. So overweight dogs don't just live shorter lives but also the quality of their lives suffers too. Giving too much food, offering high calorie human food to dogs in addition to main meals, and providing too little exercise are all factors that have been blamed for rising levels of canine obesity. When looking at your dog from above, there should be a slight narrowing between the end of his ribcage and his hips, giving him a noticeable waist. Looking at your dog's profile, the line of his undercarriage should curve from the end of the ribs towards the groin. This is more pronounced in deep-chested breeds such as the Greyhound and Whippet. When stroking your hands along the side of your dog's body you should be able to feel each rib easily, although they shouldn't be visibly prominent. Weigh him once a month to monitor weight loss or gain; this will also be helpful when it comes to working out wormer doses. Vets can offer lots of support for owners of overweight pets, such as establishing a level of safe weight loss each week. Special prescription weight-loss foods are available and are formulated to aid weight loss, and are also designed to give dogs the sensation of being full after eating. Your vet will be happy to weigh your dog and offer advice on a weight loss plan, if needed. If your dog has simply gained a few pounds, you may be able to switch to a lower-calorie food and cut out treats. Most dogs who are heavier than that will need to be fed a very restricted calorie diet and it isn't a good idea to try and simply cut down on the amount of food fed, as not only will your dog feel very hungry, but he may not receive enough nutrients. There are differences in how many calories are required by individual dogs. Some have higher metabolic rates, or are more active and can therefore eat relatively more food without putting on weight. Those with lower metabolic rates may have to be fed much more meagrely if they are to avoid weight gain. 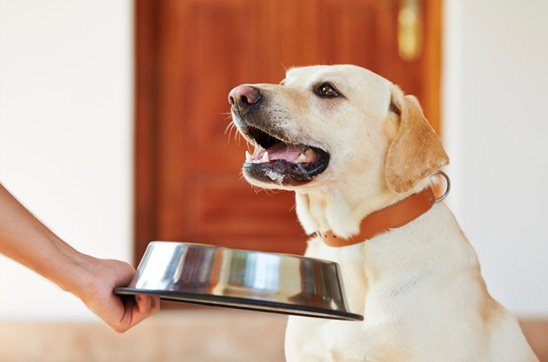 There are feeding guidelines on packs of pet food but these are just indicators of the amount of food your dog requires and should be used as starting points only. If your dog is constantly leaving food and is maintaining, or even gaining weight, you are probably feeding too much and you need to scale back. Over time you should be reassessing and adjusting the amount you feed to keep your dog in good body condition. If you intend to feed treats you should adjust the amount of food you give accordingly.